Consist of lightweight, aluminum sidewalls, coupled with heavy-duty hydraulic struts. The strut contains a hydraulic cylinder and return spring, and is protected by steel box tubing. A uniquely designed manifold allows the user to precisely control the flow of fluid to each cylinder, while safely outside the trench. 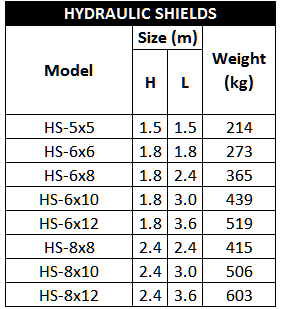 This makes hydraulic trench shields ideal for irregular size excavations. 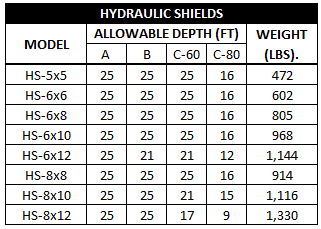 These hydraulic trench shields have a static or hydraulic option. They may be used in a hydraulic mode, providing full pressure on the sides of the trench, or in a static mode- - much like a standard trench box. Because our hydraulic shields are light weight and easy assembly, these trench shields can be handled easily by rubber-tired backhoes. They are ideal for municipal maintenance or repair projects, utility or cable work, and light- to moderate-duty general underground contracting.